Guitars, gear, & Gretsch. Since 1995 . Hello to all. I've been lurking around the site for a bit, and took the plunge to register. I've already learned a lot and would like to say thanks for the knowledge and expertise that I've encountered thus far. I've been playing guitar for roughly 20 years (with a couple small breaks during college and while in the Navy). I've run the gear gamut during that time, but have yet to own a Gretsch. That may be remedied in the coming weeks. I've played a few over the years, and liked almost all that I've had the chance to kick the tires on. A stand-out was an old Navy buddy's Nashville, and though I tried trading w/ him a couple times, he'd never let it go. Smart guy, I suppose. 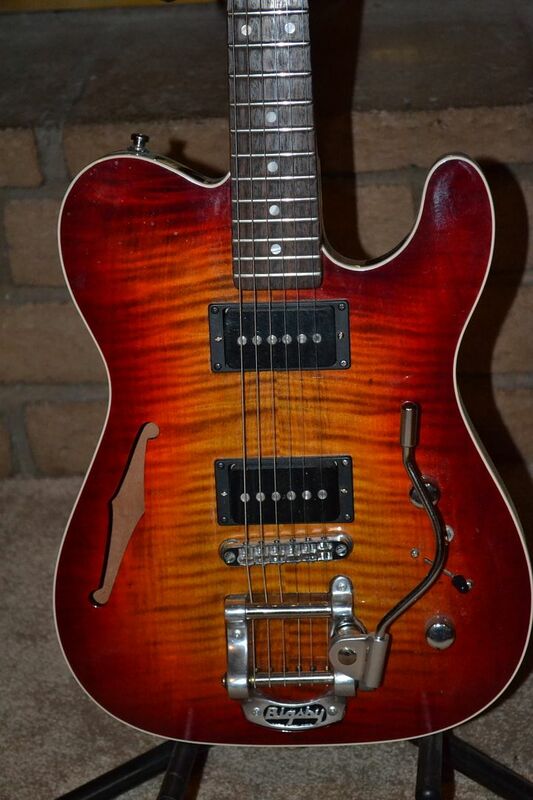 Being a "G&L guy" for the past 10-ish years (variant ASAT models primarily), I've been looking for a semi- or hollowbody for the past couple of months. I came across a used 6136 the other week, while out demoing some Duesenbergs (they didn't speak to me) and I loved it. The size, the neck, the sound, etc. Unfortunately it was in less-than-nice shape, for the asking price, and there didn't seem to be any wiggle room. So...I'm doing what a lot of us do; selling existing gear, that's currently collecting dust, in order to find and fund one. I'll keep you posted on the search, and in the meantime I'll continue to read and learn more and more about these great guitars. Welcome to the board. Some of us really like G&L guitars in addition to our Gretsches. Welcome to the club. I, too, have been a G&L guy. My SC-3 was my only electric guitar from 1984 until I got bit by an archtops bug. It landed me on a Gretsch and now I have many. Welcome to the GDP! Please be warned, with Gretsches, you can't stop at one! Welcome. You'll like it here; we're a generally friendly lot. The knowledge that is shared here is something really special. And, the true friendships formed set this place apart from any other I've enjoyed. The range of guitars now available in the line is pretty amazing, too. Watch out; in looking for your "starter" Gretsch, you may just find you need several. Welcome to the GDP, I'm glad you found us. Haha. I tried a used 7593 on Sunday (passed on it) but nearly pulled the trigger on a used Jet they also had. Must. Stay. Focused. Nice finish on that one! I’ve run through a S-500, a Legacy, the std., ASAT Bluesboy, a std., ASAT classic, and currently have one of the Detroit Muscle series ASAT Bluesboy 90 (though I swapped both pups for Wolfetones), and a recently acquired Doheny V12. G&L have been the only staple in my stall for years. Love them. This in itself motivates me to greet you heartily as a hale fellow well met. By conviction, I'm a G&L fan - though I've only owned a Tribute ASAT with MFDs, and ultimately sent it on its way for failure to bond. I spect an f-holey full-on ASAT with more trad pickups would have been a keeper. Especially in the honey blonde kinda butterscotch burst they once had. Whatever it's called. There are ever so many great Gretsch builds, each unique unto itself. Combine two scale lengths with a dozen or so specific body builds (and bracing) with three utterly distinctive families of pickups (though the Hilo family is kinda childless), and you have just enough parameters to generate a surprisingly vast variety of permutations. You're in for a ride now. Well, you're on the right track, with Rocky and Gretsch. Welcome to our addiction. Somebody had to say it.